Maruti Suzuki launched the new WagonR a couple of days back, with prices ranging from INR 4.19 Lakh to INR 5.69 Lakh. The Indian manufacturer has now unveiled a range of accessories which can now be equipped on the new WagonR. The range of accessories involve a variety of things, both for the interior and the exteriors of this lovely tallboy hatchback. The new WagonR is offered with two petrol powered engines and an option of either a 5-speed manual or a 5-speed AMT gearbox. Here is an extensive image gallery of the accessories available, linked below at the end of the article. Do bear in mind that the review of this vehicle is currently on Embargo and this article will just inform you about these accessories available in the new car. Do stay tuned for a detailed review if the car, coming very soon. Maruti Suzuki has created three themes for accessories on the WagonR – Play Time, Robust and Casa – targeted at different needs of customers. 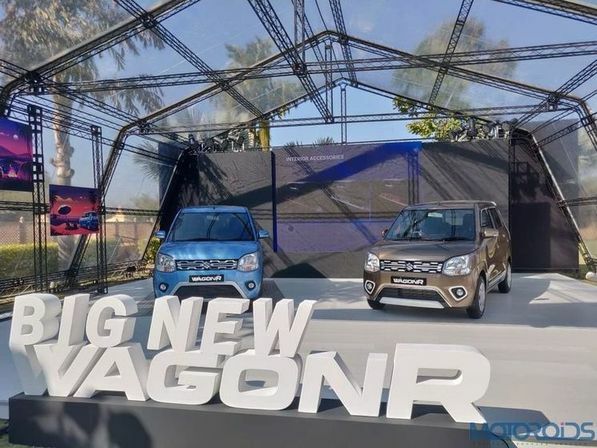 You will see two new WagonR’s in front of you, one in blue and one in brown. Both these vehicles display a variety of standard accessories available. The blue car seen in the video gets certain silver accents in various areas in the front and rear, with some additional chrome bits as well, us Indians do love chrome. The changes continue on the inside as well, with a granite design panel insert in the centre and door panels of the vehicle. The mats too, follow a blue and silver theme, matching the exterior of the vehicle. The brown car, takes another play on available colours. This car gets Ivory inserts in the front, rear and even rain guard of the vehicle. On the inside one can notice a nice orange black theme all over, even the seats and floor mats. Also Read: New 2019 Maruti Baleno: What’s New? Do watch our video, linked below to know more about the available accessories, in detail and do stay tuned for a detailed review of the car, coming out very soon. Do feel free to have a look at the image gallery of the vehicle, linked below.